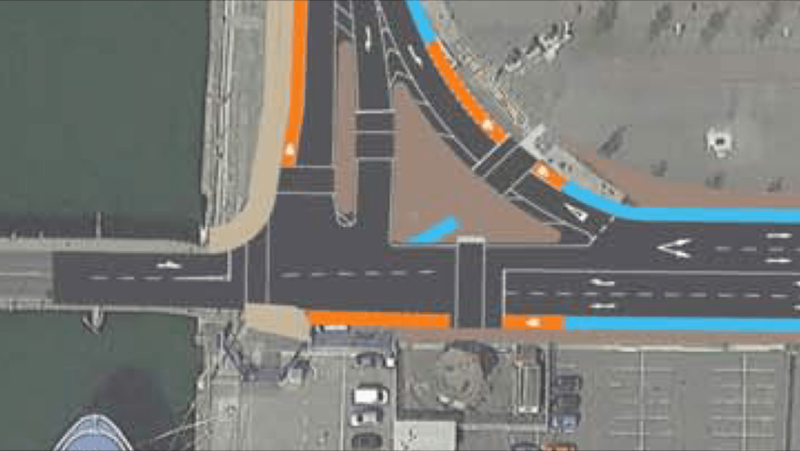 Dublin City Council is planning to replace the Point Village roundabout with a three-arm signalised junction with a left-turn slip lane from North Wall Quay to East Wall Road. A report with the design drawings for the scheme outlines how there is high volumes of walking and cycling at the junction at peak times, and how it is planned to create “a safe and convenient” paths and crossings for walking and cycling. However, the project is well within an urban built up area covered by national guidance in the Manual for Urban Roads and Streets, but does not follow that guidance. 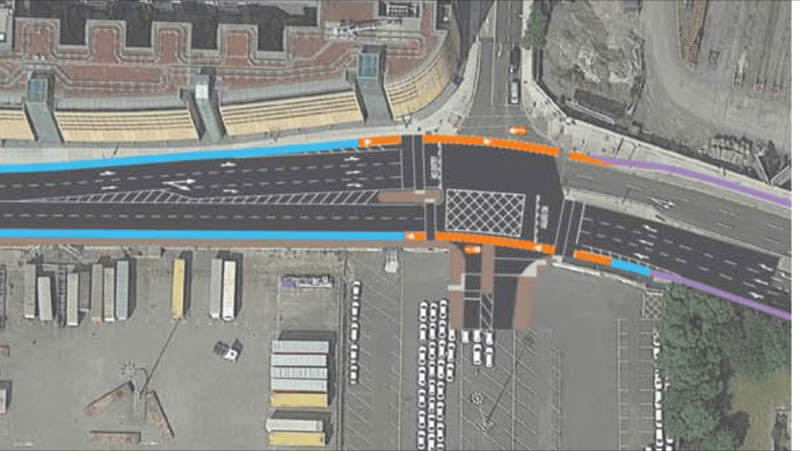 The project includes a number of elements the mandatory manual argues against, including staggered pedestrian/bicycle crossings and a slip junction. People on bicycles crossing the East Link Bridge northbound from East Wall Road are also directed into an area designated as a pedestrian area, those who do not take this option have to cross a wide slip road junction unaided. While those crossing the bridge southbound are directed into a shared footpath, when the narrow footpath on the bridge remains just as footpaths under this scheme. The design also makes use of shared use footpaths which mixes walking and cycling. 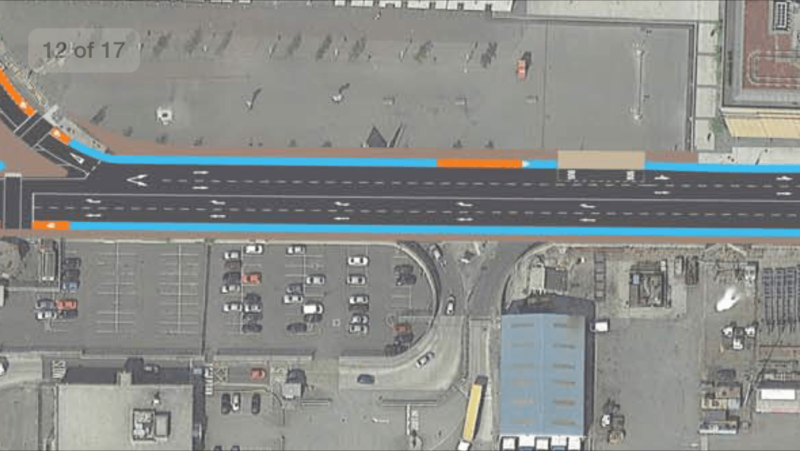 For example, if you were cycling on the planned two-way Liffey Cycle Route on the quays towards the replacement junction for the routabout, the only way to continue north along East Wall Road would be to use and use three separate pedestrian/bicycle crossings to get to the other side of the road. More detailed versions of the plans are online here or may be inspected or purchased from Friday July 17 2015 to August 31 2015 at the offices of Dublin City Council, Public Counter, Planning Department, Block 4, Ground Floor, Civic offices, Wood Quay, Dublin 8 Monday to Friday 9.00hrs to 16.30hrs. Or at the Dublin Docklands Development Authority Offices Monday to Friday 9.00hrs to 17.00hrs. A submissions dealing with the proper planning and sustainable development of the area in which the development can be made in writing to the Executive Manager, Planning Department, Dublin City Council, Block 4, Floor 3 Civic Offices, Wood Quay, Dublin 8 before 16.30 hrs on 14th September 2015. KEY: Orange: cycle lanes; blue: cycle paths; brown: footpaths and traffic islands; sandy colour: shared use footpaths. What are those orange boxes in the last photo? Are they even legal? Getting rid of this roundabout is a miracle! It will completely improve my life when in Dublin; I think of the person killed on that roundabout every time I negotiate it. Their traffic modelling shows slightly longer queues at the junction, which shows they’re actually reducing capacity to cater for people walking and on bikes! Have to say thought that, coming along north quays, they need to do better to get me across to the Point side of the road so I can either make a legal on-road right to East Link, or left along East Wall Road. And don’t get me started about ‘cyclists dismount’ signs on East Link. When Council take it back in January I PRESUME they will be ripped down. Finally, slip road is too fast- should be a tighter curve. Anyway thanks again Cian, keep up the great work! What is the point of DMURS if it is not observed? Presumably this is still part of the S2S route. If so, are there any plans to improve/provide cycling facilities on the rest of East Wall Road? Has there been any consideration of adding cantilevered bike paths to the East Link bridge?